Reading and share top 10 famous quotes and sayings about Chemical Weapons by famous authors and people. Browse top 10 famous quotes and sayings about Chemical Weapons by most favorite authors. 1. "Although every step must be taken to protect against a chemical or biological attack in America, our nation would survive the use of those weapons as we did when anthrax was mailed to our Capitol and other targets." 2. "As for the third Official Reason: exposing Western Hypocrisy - how much more exposed can they be? Which decent human being on earth harbors any illusions about it? These are people whose histories are spongy with the blood of others. Colonialism, apartheid, slavery, ethnic cleansing, germ warfare, chemical weapons - they virtually invented it all." 3. "Saddam Hussein has systematically violated, over the course of the past 11 years, every significant UN resolution that has demanded that he disarm and destroy his chemical and biological weapons, and any nuclear capacity. This he has refused to do." 4. "Maybe they'd use biological or chemical weapons instead. Maybe they'd crash the world economy. Maybe they'd turn every program on television into one of those reality shows. ""That's mostly done already, Harry.""Oh. Well. I've got to believe that the world is worth saving anyway." 5. 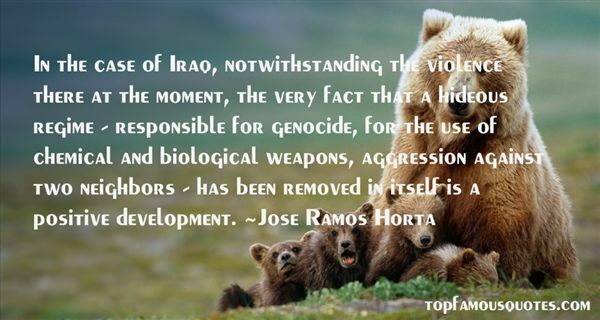 "In the case of Iraq, notwithstanding the violence there at the moment, the very fact that a hideous regime - responsible for genocide, for the use of chemical and biological weapons, aggression against two neighbors - has been removed in itself is a positive development." 6. "The Germans sell chemical weapons to Iran and Iraq. The wounded are then sent to Germany to be treated. Veritable human guinea pigs." 7. 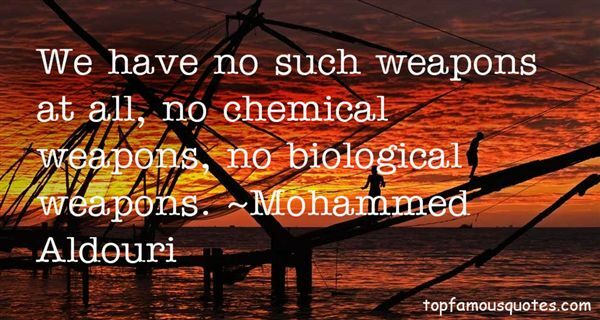 "We have no such weapons at all, no chemical weapons, no biological weapons." 8. "We must perfect a worldwide system of accountability for nuclear, biological and chemical weapons." 9. "I like to call a spade a spade in politics and in everything else. That's why the zionists and the americans...The top officials hate Saddam Hussein.The White House is lying once again. He's a liar.He's the world's number one liar.He said there were chemical weapons in Iraq, and that Iraq is connected with terrorism.Later he declared: 'We didn't find any of this in Iraq. 'What I want to say is that he also declared that what Saddam Hussein says is not true...This is defamation of your president of thirty five years." 10. 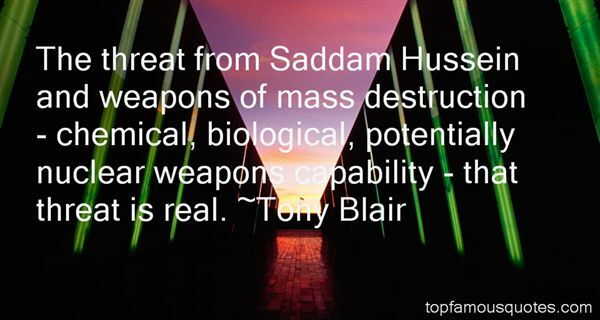 "The threat from Saddam Hussein and weapons of mass destruction - chemical, biological, potentially nuclear weapons capability - that threat is real."